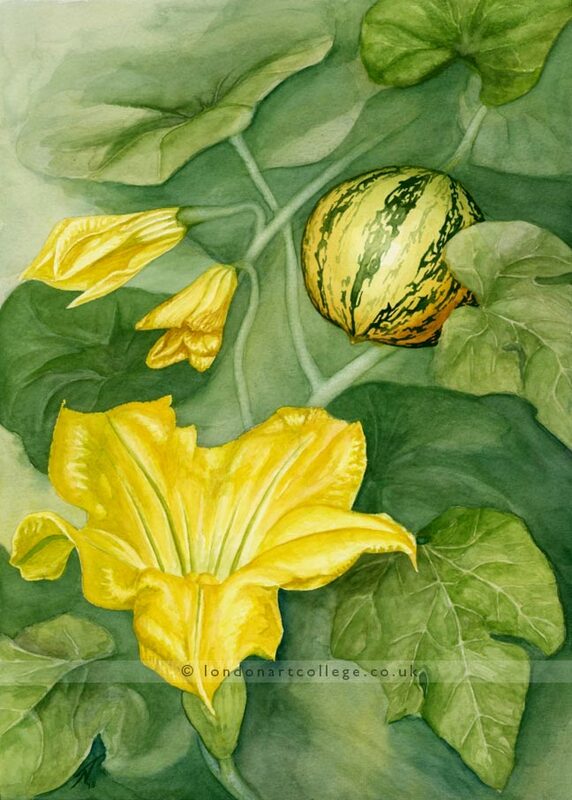 Nina Tadsen is currently completing our Watercolour Diploma course. Tutor Ida has been so thrilled with Nina’s artwork she has asked her if she would consider enrolling the Botanical Watercolour Course. You’ll see why! You can also read about the beautiful artwork from Nina below too. inspiration for me. This summer I grew ornamental pumpkins and took photos while they were both blooming and bearing fruit. I did not copy one photo exactly but used several photos and drew some sketches to plan the composition for this assignment. this painting are cadmium yellow, french ultramarine and Windsor blue for the yellows and greens. Some cobalt turquoise was used in the mix for a cooler background and burnt umber for the darker areas of the pumpkin.